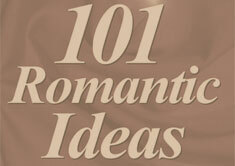 The Romantic’s Guide: Hundreds of Creative Tips for a Lifetime of Love is a 208 page book creating quite a bit of a buzz in the media. It is currently ranked among the TOP 5 best-selling marriage books and is the #1 dating and romantic ideas book in America! If you are searching for some refreshing and new ideas on dating, gift giving and celebrating your love every day, then The Romantic’s Guide is a book for you. It contains hundreds of Michael Webb’s notoriously clever and whimsical ideas on expressing love as well as contributions from romantics all over the world. Michael Webb’s #1 bestseller, in bookstores nationwide and Amazon.com (as low as $4 in some stores). Get extra for wedding/engagement/special occasion gifts.